Everything you need to build your website at your fingertips. Choose from loads of beautiful templates then customise to your hearts content. Responsiveness without the effort – one site, any device. Want it built for you? Make an impact and look professional with a personalised email address. Every package includes a 5GB mailbox so you have everything you need to get started straight away. Start your online journey with a free domain name. Choose your perfect name from the most popular extensions - .ie, .com, .net, .org and .online. Protecting your website and your customers is a top priority. With our website builders, your SSL certificate is included and can be installed with just one click. Not sure which package to choose? Our website gurus are on hand and ready to help, 7 days a week. Give us a call and we'll find the right package for you. 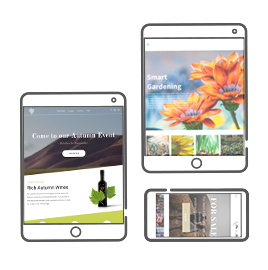 Our Website Builder has been designed to give you full access to create, or edit, your website from your mobile phone or tablet. The clever software is easily usable on handheld devices so you can tinker with your website wherever you have internet access. Anyone can build a website, you don't need any technical experience! Simply use the intuitive drag & drop editor to quickly add content, images, videos and widgets to your site including forms, popups, social icons and Google maps. Your website will always look its absolute best and function smoothly no matter which device your visitors are using. Whether its a desktop, tablet or smartphone, each template and all images will automatically resize to the device. Impress your visitors by adding images to your background and create movement using the slider. You can also embed YouTube or Vimeo videos to increase user engagement and create a more visual user experience. Make life easier - speed up the design process. You can duplicate website pages, define site-wide settings for text, images, buttons and backgrounds and choose professionally pre-designed sections. It's simple! Bring your website to life by adding your own images or choosing from our extensive library of FREE stock images and GIFs. You can even edit them with the built in image editor. Crop images, add overlays, effects and filters, resize or add frames and text. Showcase your work, products or images on any page with an eye-catching photo gallery or a swipeable image slider. Customise by changing the layout, adding buttons, text, titles, captions, animations and lots more. Once you've chosen your dream design template, make sure to put your own stamp on it! Choose colours, customise images and video overlays and choose from over 100 font styles for your website. Your customers can enjoy the ultimate personalised experience when visiting your website. Using our powerful website personalisation tool, your site's content will automatically adapt when activated by pre-defined triggers such as number of visits, time of day or visitor proximity. Simply choose from a library of pre-made actions such as adding a special message for first time visitors, displaying a discount code to mobile users, showing the dinner menu from 6pm -10pm, or create your own to fit with your unique business goals. Encourage your visitors to 'like', 'tweet' and 'share' your content by quickly adding social media icons such as Facebook, Twitter and LinkedIn to your site. You can also embed YouTube videos so your visitors can view your content without ever leaving your webpage. Make it super easy for your customers to connect with you by adding click-to-call or click-to-email buttons. With just one click they're through to you – the best way to do business. Add popups anywhere on your website to promote sales, encourage customer interaction and newsletter signups or to personalise your website for specific visitors. Add a quick way for customers to get in touch via a customised contact form. Choose from multiple layout and style options and easily integrate it with email marketing software such as Constant Contact, MailChimp and Google Sheets. Help your customers find you by adding Google Maps and step by step directions to your business. Already have your menu online? No need to start from scratch - simply sync it and edit to make it pop. Add images, change the list order, customise the layout and much more. Display your top Yelp reviews to help build trust and credibility with your customers. Make Google happy with a super fast website. Site speed is a key ranking factor and with our website builder, yours will be optimised for Google PageSpeed automatically. A speedy website has been proven to be great for user experience and helps get better search results – it's win, win! Clearly show your visitors where they are on your website and improve search engine visibility by customising the URLs on each page. Want to get to page one on Google? Start with some SEO basics – easily add page titles, image tags and meta descriptions to help search engines understand what your website is all about. Tell search engines which pages to crawl by setting up your sitemap. It's genrated for you so all you need to do is quickly add it to your site. Everything you get with Starter… and much much more! Personlise your website by displaying unique messages or offers for every visitor. Each message is based on a trigger like the time, user location, how many times they've visited your site, how they found you etc. Find out more about website personalisation. Want to add more to your website? Don't be restricted - create as many pages as you like with our Professional package. Whether you want to dedicate a page to a photo gallery or add more information about you and your services – there's no limit, so get creative! Regularly connect with your visitors and keep them up to date with relevant news and information by adding a customisable blog to your website. Not only is it a handy way to communicate, it looks great on any device and automatically matches your site's design. 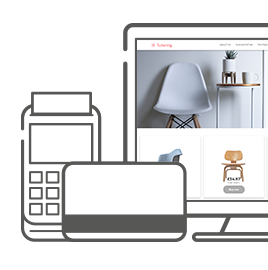 Control and customise every element of your website on every device. Change how your site looks and works on a desktop compared to mobile or hide various elements on one device and show on the other. Customers can easily book an appointment or make a reservation via your website, from any device, using vCita online scheduling or OpenTable reservation service. Boost your business and make informed decisions by analysing your site's statistics. View how many visits your website gets, where your visitors are from, which pages are most popular and much more. Plus, you can easily integrate Google Analytics for a deeper analysis. Take your website further… open it up to the whole world. With more than 55 International languages to choose from, you can easily implement new languages and quickly edit individual pages so nothing ever gets lost in translation. Dive inside your website and access the HTML and CSS code to create something entirely unique. You can design your own layouts, build interactive pages, add animations, implement customised tracking and much more. Enjoy complete peace of mind! Before making any changes to your website, simply backup the current version so you can revert to it if your changes don't go according to plan. No time to build your own site? No problem, our Studio Team can help. From just €449, we can create the website of your dreams. A website gives you an online presence and provides an instant way for you to connect with your target audience. Whether you want to make a simple one page site to display your contact details or a more informative site; having an online presence will give you a distinct advantage over your competitors. It's a website design package that allows you to build, customise and manage your own website. You don't need any technical skills or creative ability – simply choose the template that's right for you, add your information and images, customise colours and styles and publish to your domain name. Can anybody use Starter & Professional packages? Yes of course! They are used by a variety of businesses including hair and beauty salons, plumbers, carpenters, medical practitioners, florists, retailers, photographers and many more. If you're an artist, a blogger, a sports fan or nature lover, building a site is also a great way to showcase personal projects and special interests too. No - that's the best bit! You won't need to write any code like HTML, CSS or PHP or have any design skills at all. In fact, you don't even need to know how to make a website because our website builder makes it easy with the drag and drop editor. Can I make a mobile version of my site? Yes and you only have to make one site because the layout adjusts seamlessly to fit all devices. You can even build, edit and update it via your mobile phone or tablet. Yes and it's really easy to do. You can add pages, content, sections, forms, images, social media buttons, galleries and more. You can also change colours, styles, text sizes and fonts – your options are endless. Plus, with Professional you can use website personalisation, try out developer mode, add Yelp reviews and enable customers to book appointments or make restaurant reservations. An SSL is a digital certificate used to protect your website and visitors against fraud and phishing scams. It secures the connection between your users and your website and encrypts any data exchanged between you. If your visitors share any sensitive information such as payment details or personal information, we recommend always having an SSL certificate. FREE SSLs are included with all our website builders. Can names.co.uk build me a website? Yes and we'd love to help. If you don't have time to build your own site, our Studio Team will do all the work for you. Find out more and contact the team to get started. Don't fret! We have created loads of support articles and videos to help you create the site of your dreams. Take a look at them all here.